Hemel Hempstead Town return to National League South action on Saturday as they travel to relegation-threatened Havant & Waterlooville. The Tudors go into the game on the back of a disappointing display against St Albans City in the Herts Charity Cup on Tuesday night, and Dean Brennan’s side will be desperate to put an end to their seven-game winless run. The 12th placed Tudors have drawn their last two league outings, while Havant have been on an impressive run of form which has seen them clamber out of the relegation places. That run has left Havant just three points behind Hemel in the league standings, despite seven places separating the two sides in the table. 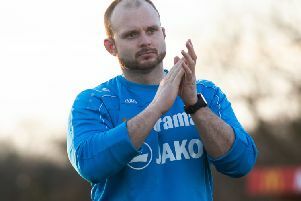 The Tudors will have to reshuffle their pack once again, with strikers Jamie Slabber and Adam Morgan having departed the club this week – leaving new signing Ibra Sekajja as the club’s only recognised out-and-out striker. Michael Richens is also a doubt for the game after picking up a knee injury at St Albans, while Ed Asafu-Adjaye remains a long term absentee. Havant go into the game as favourites with the bookies’ (21/10), while Hemel are on offer at around 85/40, with the draw currently priced in the region of 11/5. It was the Tudors who came out on top when the two sides met in January as they registered a comfortable 2-0 win – that was, in fact, the last time that Hemel tasted victory.